Reykjavík: Uglan - Íslenski Kiljuklúbburinn, 1992. 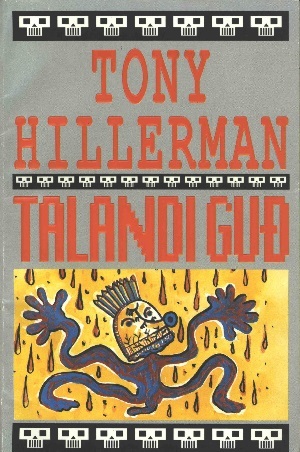 This is the Icelandic paperback edition of Talking God, the ninth book in Tony Hillerman's Navajo Mystery Series. This 1992 edition was published by Íslenski Kiljuklúbburinn in Reykjavík, Iceland. The text was translated from English into Icelandic by Þorbergur Þórsson. The cover was designed by Steingrímur Eyfjörð Kristmundsson. Binding: Full color paper covers with author's name and title printed vertically in red on the spine. In addition there is one of the skulls from the cover design and an abstract design also on the spine.